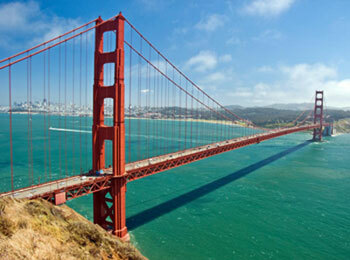 The city of San Francisco has a mystique of its own and is one of the most visited cities in the world! This major Californian city is surprisingly compact, despite the incredible amount of things to see and do! 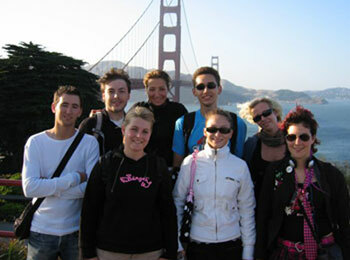 Learn English in San Francisco for the scenic beauty of the hills and coastline, for the fresh air, for the friendly, liberal people, for a summer-fog experience and for the picturesque Victorian architecture! San Francisco has a mild climate influenced by its latitude and proximity to the coast. It is not known for the typically hot Californian temperatures experienced further South. July to September are generally the warmest months, whilst January is the coldest. In this beautiful city by the bay, you will find the Golden Gate Bridge, the well-known Painted Ladies of Alamo Square and world famous Alcatraz. 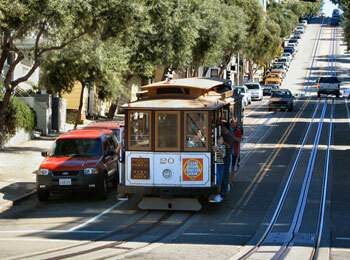 You can also visit diverse districts such as North Beach, Fisherman’s Wharf and Chinatown. In San Francisco you can find elements that are totally unique to a major city, such as the “secret” stair climbs. Throughout the city, there are many wonderful staircases cut into the hills - for pedestrians only. These shortcuts up slopes and through backyards will reveal stunning views that you can only get by doing the footwork! If you still have energy at the end of the day there is nightlife galore in San Francisco, as well as restaurants to suit all tastes and budgets! Many of the most popular spots for going out are reachable by cable car - which is a great way to “hop” over the hills during your stay! Our English language school is located right in the heart of downtown San Francisco, within easy reach of all of the main attractions. 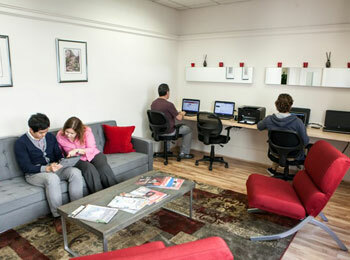 The school is a very friendly, medium-sized school, which occupies four floors of a modern business centre. Union Square and the gates of San Francisco’s Chinatown are just two blocks away. There are 34 classrooms, many with interactive whiteboards, a self-access resource centre, 2 computer rooms, a digital language lab and a library, as well as 2 student cafeterias and a student lounge! There is a wide range of English language programmes to choose from, with a maximum of just 12 students per class in the group courses. Our school’s Intensive and Super-Intensive courses are group based, allowing you to meet, study and socialize with lots of other students. These are the most popular courses, designed with the main goal to help students communicate effectively and confidently, in a wide range of real-life circumstances. You will learn skills in all aspects of the language, including speaking, listening, reading, writing and pronunciation. The Intensive course consists of 20 group English lessons each week or, for more ambitious learning, you can choose the Super-Intensive course, of 28 group lessons each week. Students who wish to maximize their progress, or who have limited time in San Francisco and need a more flexible or personalised programme, have the option to book a course of Private English Lessons. This type of programme is also ideal for students who need to cover particular aspects of the language, or specialised English for their career or further studies. Another course suitable for professionals or students who already have an intermediate knowledge of English and who wish to further their skills for use in the workplace, is the Business English course. You will have your general English classes (20 per week) in the mornings and then 8 afternoon classes per week focussed on English for the business environment. Topics included are: negotiation skills, managing business meetings, using the telephone for business, giving presentations and writing minutes, reports, e-mails and letters. Students who take this course can choose to prepare for the Cambridge Business English Certificate (BEC). There is also a more advanced Business English course for mature professionals on offer - a platinum course, consisting of 20 classes each week, where groups are reduced to just 5 students maximum. Our school also offers a variety of courses to prepare you for the world renowned Cambridge Exam, or for the TOEFL Exam. The Cambridge Examination is the most respected formal English qualification, which can help you in your future studies or your career. The Exam Preparation course starts several times per year and you can study for 6 to 12 weeks, as you decide. The courses lead up to the Cambridge exams held in March, June, August and December and you will take the exam before leaving our school and San Francisco. The TOEFL, Test of English as a Foreign Language, preparation course also has various specific start dates throughout the year and is aimed at non-native students who are thinking to study at USA or Canada based colleges and universities. The ideal choice of accommodation if you wish to practise your English outside of the classrooms as much as possible is to stay with one of our school’s carefully selected host families. Californians are well known for their hospitality and friendliness and this is a great way to get an insight into daily life of the local people, as well as increased opportunities to get to know different parts of the city! You can choose half-board or breakfast only, as you prefer and all host families are located 30-45 minutes from the school by public transport. Superior host families are also available, where you will have your own private bathroom. For more independence during your stay, as well as the chance to live with other international students, you can choose either a single or a shared room in one of two different residence buildings, namely ‘Kenmore’ or ‘USA’ in San Francisco. The Kenmore residence has a 24 hour reception and a secure entrance system. Breakfast and the evening meal is available here. Each room has a telephone and there is a games room, lounge with TV, library and laundry room. The USA residence building is located only 15 minutes walk from the school, in a great location in downtown San Francisco. All of the rooms have a refrigerator and microwave and TV. There is a shared kitchen for you to prepare your meals as well as a dining room, large lounge with games machines, library, movie theatre and onsite laundry facilities. Both residence buildings have free WiFi internet access and you can choose to have a private bathroom or the cheaper shared bathroom accommodation. 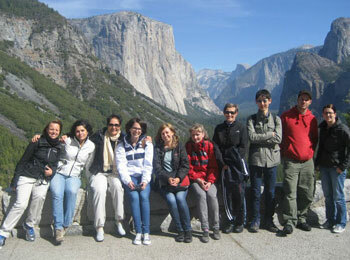 The school offers an exciting and varied activities programme each week so that you can get to know each other and make the most of your stay and your free time in California! Some of the regular organised events include: Walking or cycling to the Golden Gate Bridge, Museum tours, Movie evenings, Bay Cruise and Alcatraz Island, welcome parties and more. The weekends bring you the chance to see more of the USA and beyond, on excursions to other places of interest such as: Yosemite National Park, Los Angeles and Hollywood, Disneyland, Lake Tahoe or to the Napa Valley and Sonoma Wine Regions! There is something for everyone in the cultural and activities programme offered by the school and the staff are also always ready and eager to help you with any further advice you may need, in order to enhance your adventure and your English course in San Francisco! If you like, our school can collect you from San Francisco International Airport and take you directly to your accommodation. However the transfer cost is not included in the fees.